Living is an art, skill, technique that needs to be learnt and practised. The Bhagavad Gita enunciates the ancient philosophy of Vedanta and presents the eternal principles of life and living which transcend race or religion. The principles equip one with a strong intellect to meet the challenges of the world and achieve success and peace in all aspects of one’s life – official, social and domestic. Above all it ushers one towards ultimate perfection, the goal of spiritual enlightenment. Chapter XVIII of the Gita defines sannyas a renunciation and tyaga relinquishment. A detailed analysis of the causes, incentives and constituents of action follows. The different aspects of action are further classified into the three gunas, qualities of sattva, rajas and tamas. It helps one to assess one’s personality and determine spiritual development. The study of Bhagavad Gita helps to purify one’s personality and attain the ultimate goal of enlightenment, a state of total fulfilment. Bhagavad Gita is systematically taught at the Vedanta Academy, Pune, India. The academy was founded by Swami Parthasarathy, a world renowned Vedanta philosopher and management resource. The academy offers three years full time residential course on Vedanta philosophy. The youth from all over the world with diverse cultural backgrounds study at the Vedanta Academy and learn the technique of life and living. The alumnus of the Vedanta Academy conduct Vedanta study classes, workshops and organise public lectures in different parts of the world. The same three year course is also available through E-learning. Sunandaji the daughter – disciple of Swami Parthasarathy has been studying and researching on Vedanta, for over three decades. Her clear and powerful presentation of the Bhagavad Gita in contemporary thought has been acclaimed in India and abroad. Sunandaji has also addressed prestigious corporate organisations and universities worldwide on the practical application of Vedanta in daily life. 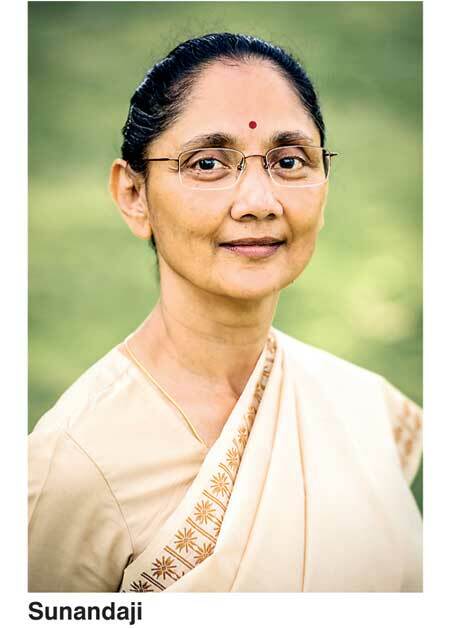 Sunandaji is a senior trustee of the Vedanta Cultural Foundation, a charitable trust dedicated to the study, research and propagation of Vedanta. The Foundation has been accorded the coveted status of a Scientific Research Organisation by the Government of India. The Foundation runs the Vedanta Academy in India, an institution that serves as a world resource of Vedanta knowledge through its full-time residential courses. Sunandaji will be delivering a lecture series on the chapter XVIII of the Bhagavad Gita from Saturday 25 to Tuesday 28 February 2017 from 6:30 p.m. to 8 p.m. at the Buddhist Cultural Centre, Havelock Road – Thummulla junction, Colombo 05. The lecture is open for all and free of charge. For further details contact: vedanta.sl@gmail.com or 0779213854.